We have arrived: living a digital life so robust that managing passwords to our online existence requires serious maintenance. In our series on organizing personal paperwork, the suggested project for this month is to invest time in your calendar to update your personal password file – and to develop a routine to easily keep them current. Are you ever curious how other people manage all the online information they are supposed to remember? 5) Handwritten list on notebook paper with multiple additions/changes, hiding among desktop papers. Do you recognize your own method among these options? How do you determine what’s the best system for you? 1. Determine the best format for individual use, such as a resident computer file that can easily be updated (an encrypted Excel file) or a cloud service that stores information for use among many electronic platforms, including desktop software. Visit the password manager links to review compatibility with your computer system, availability of mobile options and crossover use, and pricing options (free or subscription based). 2. Create a new password file (or online account) or make edits to your current computer file to eliminate multiple notes around your desk with changes/additions. List vendor sites alphabetically and/or create categories to tag sites. Start by blocking out 30 minutes at a time to create a new file, or to populate an online cloud service account. 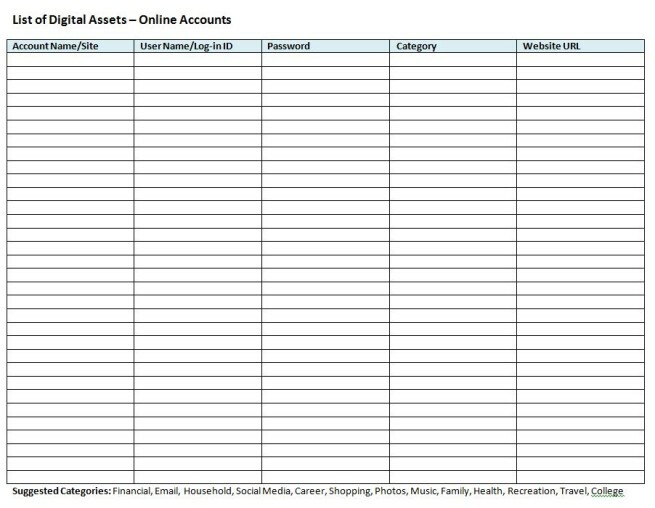 If you use a spreadsheet to manage passwords, create enough columns to include all the relevant information. Some examples include: Account Name, Web Address, User Name, Log-in ID, Password, Category, Security Answers, Other. 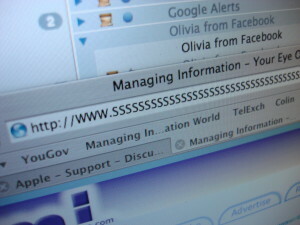 Many of the online password managers offer a database-like tool to enter supporting information for a site in addition to the password, such as account numbers and answers to security questions. They also offer options for automatically generating passwords to reduce account hacking. If you don’t schedule regular time in your calendar for maintenance, it’s likely that it won’t happen. An important element to maintaining your digital identity that isn’t discussed much is the question of how your online information will be managed when you become incapacitated or die. To make it easy for a loved one to access your accounts and bring closure to your digital afterlife, be sure to inform a trusted family member or your designated legal representative where you store and how to access your password file or important accounts in an emergency. Another option is to utilize an online service to manage this process. Several options are listed at The Digital Beyond, many offer a range of options to manage or communicate your wishes. As technology evolves, so will our online options for staying secure and managing our personal affairs – another reason to stay up to date on current trends and best practices. Please comment below if you have another password management system to recommend, or a technique that works specifically for you!